Meredith Moore is an instructor at MICA. She is a filmmaker and artist working with experimental film and projection techniques. Her work has been shown at various film festivals and venues including Anthology Film Archives, Athens International Film Festival, London’s Roundhouse, Maryland Film Festival, Videology in Brooklyn, Cucalorus Film Festival, Nonplussed Fest (Jury Award: Best Experimental Short), Seattle Transmedia & International Film Festival, Washington Project for the Arts, and The Walters Art Museum. 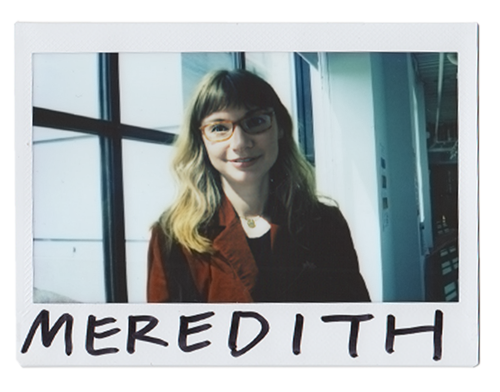 Meredith is the founder and curator of Secret Psychic Cinema, a screening and workshop series which showcases avant-garde and experimental works, and was a recipient of a Grit Fund Grant from The Contemporary. She is also on the screening committee of the Maryland Film Festival and is a member of the Baltimore Video Collective which is opening a non-profit film lending library in Baltimore City.